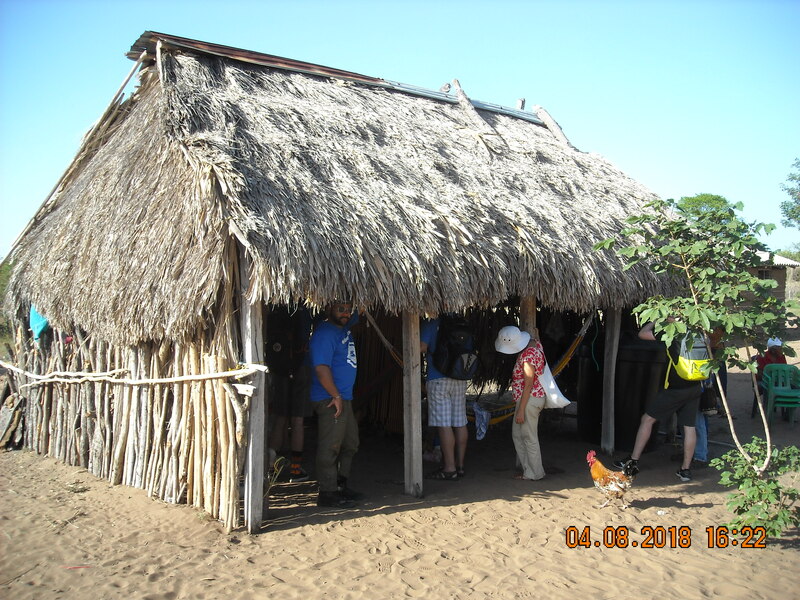 I have visited the area many times, but this was the first time I visited communities affected by the railway which carries coal from the mine in the south of La Guajira to the coal export port at Puerto Bolivar, a hundred miles to the north east of the mine. The railway crosses the heart of Wayuu territory – the Wayuu being the most numerous of Colombia’s Indigenous Peoples. 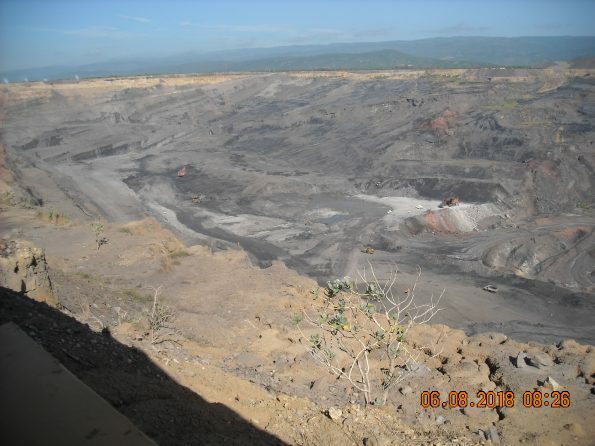 At the village of La Gran Parada, home to 21 indigenous families, we were told that the long coal trains pass frequently and produce contamination all the time, because of coal dust which blows off the open coal trucks. Coal dust settles in the village and in the local jaguey, or water hole, causing health problems for both animals and people. Mine management tell us that they do their best to reduce fugitive coal dust by compressing the coal with water and surfactants, and they monitor air quality in order to be able to take action quickly should it be necessary. Nonetheless, the concern remains. We were told that the military presence is causing division between the generations: “We used to listen to our parents and grandparents, but now young people don’t want to listen. Young people associate with the military, get shirts from the soldiers. Now young men want to join the army instead of raising animals and practising agriculture. 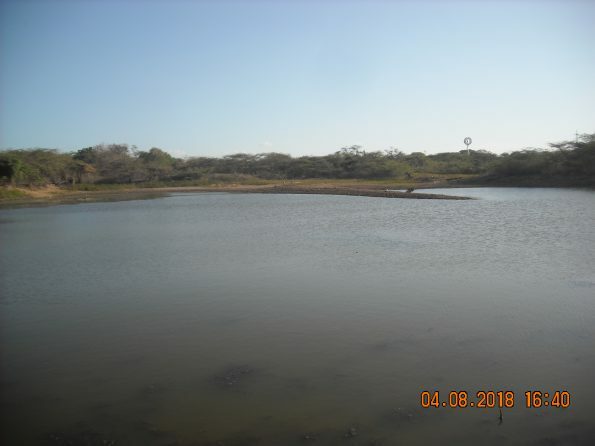 Wayuu people can usually get out of military service but now lots of young people want to do it.” The militray presence undermines indigenous tradition in other ways, too: “The military is now appropriating our water sources so we cannot use them. According to our custom, when we go to bathe and swim at the jaguey, men and women bathe separately. Soldiers began to come and watch.” The soldiers’ voyeurism discourages people from maintaining their traditions. Mine management tell us that the soldiers are in the area to carry out their constitutional duty to protect citizens from illegal armed groups and criminal organisations as well as to patrol the national border and protect economic infrastructure. Human rights training is provided to military personnel and complaints about their behaviour can be taken up with the company’s complaints office. Well, local residents do indeed take matters to the company’s complaints office – but the complaints continue. At Paradero we heard again of people’s fear of being attacked. People who criticise the mine sometimes get accused of being guerrilla sympathisers, and then they can be targeted by opposing armed groups. Mine management tell us that they also are very concerned about threats against their critics and that they have publicly denounced such threats. They always take news of such threats to the relevant government bodies for them to investigate and take whatever action is necessary. The problem, of course, is that successive Colombian governments have established a woeful track record of complicity in appalling human rights abuses, and recent Colombian governments have made a point of favouring large-scale mining projects over small-scale farming. Not much is to be hoped for from the authorities. That’s why we have to continue our solidarity until the communities affected by Cerrejon Coal get the justice that they deserve. Remarks in this report have not been attributed to individuals in order to avoid people receiving further threats to their lives or the lives of their families.